7.2 Tahir Salahov: A Hint of Red - Pushing the Limits of Social Realism. For Azerbaijani painter Tahir Salahov, red is a color that's best used sparingly. It's great for accenting specific objects - whether it be naturally red objects such as chili peppers, pomegranates or books, or objects not normally associated with red such as an oil tanker, an oil pipeline, a man's shirt, a windmill or even the Eiffel Tower in Paris. In Tahir's early work, apart from this touch of red, the remainder of his canvas was typically spread with neutral tones ranging from light gray and beige to darker shades of olive, brown and black. Take away the red, which obviously was associated with Communism, and the painting loses its dramatic edge. Tahir's development as an artist starting out in the 1950s was largely shaped by the Soviet government's mandate-namely, that all artists should paint according to the style defined as "Socialist Realism". Socialist Realism insisted that paintings should mirror "real" life; that is, artists should "paint what they see." Soviet authorities thought this would facilitate the ability of the masses to comprehend art. In other words, artists were not free to use symbolic representations. Colors and shapes should be realistic. However, the term "Socialist Realism" also implied that the subject matter that artists painted would be cheerful, productive, confident and optimistic-not gray, dismal, depressing or questioning. But Tahir took this mandate a step further and created his own style, thereby making his own statement. Today people refer to it as "Severe Socialist Realism". Tahir's early works, though realistic, dare to suggest that life was not rosy and triumphant despite the fact that his themes clearly fell within the prescribed formula. As a young painter, Tahir Salahov knew all too well what could happen when one confronted the Soviet system. When Tahir was only ten years old, his father was arrested. At the time, his father was serving as First Secretary of the Regional Party Committee in Lachin, a region in southern Azerbaijan. Such scenarios were repeated thousands of times during those horrendous years of 1937-38 that became known as the years of Stalin's Repression. Like a black widow that consumes its mate, Stalin and those under his command eliminated any person of whom they were suspicious, or in many cases, any person whom they held the slightest grudge against. The individual had not necessarily committed a crime against the government though, of course, stories were always fabricated elaborating such crimes, and the individual was promptly branded as an "Enemy of the People". Tahir's father was shot and killed on July 4, 1938. Art: Tahir Salahov, "New Sea", 260 x 260 cm, oil on canvas, 1970. Tahir found refuge in the world of drawing - first, at the Pioneer Palace and later in Art College. He remembers his first introduction to art. He had borrowed a book from the library and after reading it, someone suggested that he draw pictures to illustrate the story. He kept the book several weeks longer and did just that, and thus began what turned out to be a very successful career in the arts. Later on he drew pictures for many books without prodding from anyone. His first Exhibition was for the Belinski Library in Baku. At first, Tahir's family ties hindered his career. Once as a first-year student at the Azim Azimzade Art Institute in Baku, he took part in an Azerbaijan-wide contest of young painters. Instead of using his own name, he submitted his work to the Commission via two other artists who signed their names to it. The work was awarded first prize. It took awhile before the identity of Tahir as the real painter was learned. Tahir's dream was to study at the Repin Institute of Fine Arts in St. Petersburg. But he was not able to gain admittance to the school, even though his skills were recognized by the Commission. The issue of his father blocked his entrance. The son of an "Enemy of the People" could not be enrolled. Determined to get an education in art, he applied to Moscow to the Surikov State Art Academy. This time he concealed information about his father and was successful in gaining admission. Tahir belonged to the generation of young Soviet artists that emerged in the late 1950s and early 1960s. Being from Baku, he often chose industrial Azerbaijan as the subject for his early paintings. He loved the city, Ichari Shahar (Inner City), the ancient Maiden's Tower, the Caspian Sea and its sandy beaches. He loved watching the fishermen plying their trade and the courageous workers coaxing the oil from the earth's depths. In particular, the oil workers at Oil Rocks drew his attention. Oil Rocks is a settlement built up like an island on wooden piers out in one of the shallower sections of the Caspian Sea. It marks mankind's first attempt to extract oil from under a major body of water-not only in Azerbaijan but in the entire world. Oil Rocks is nearly 50 years old now, but at the time it was quite new, having been built only 10 to 15 years before Tahir began focusing on it. Art: Tahir Salahov, "Morning Train", 150 x 200 cm, oil on canvas, 1958. Today, oil workers still live in those dormitories and work in that isolated, man-made environment. 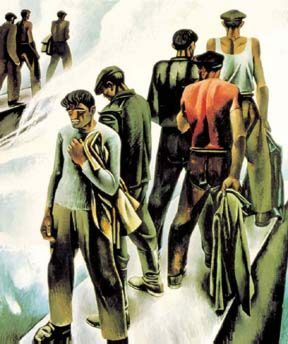 Set against this unsafe environment of the treacherous seas, the oil workers became the "heroes" in many of Tahir's paintings. They were strong and hardworking-fitting symbols of Soviet industrial might. At the time, the Soviet Union prided itself on its industrialization. One memorable work is Tahir's "Morning Train" (1958) which he painted a year after his graduation from the Surikov State Art Academy in Moscow. His painting shows an industrialized landscape in which almost everything visible is man-made. Cars and trucks speed through a highway underpass while oil tanks pass overhead. 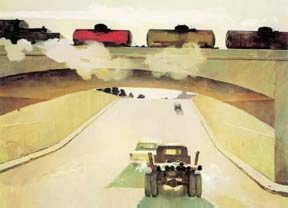 Most of the painting is made in neutral shades of sand and cement, except for one oil tank car, which he painted red. Visible exhaust coming out of the vehicles heightens the sense of movement and reinforces the industrial motif. The painting, with its dull colors and man-made modes of transportation framed in concrete, lacks the usual warmth of human interaction. Perhaps, that was part of what the artist was trying to say for those who cared to understand what was not painted into the picture. "Morning Train" was exhibited at the 1958 All-Union Art Exhibition in Moscow, commemorating the 40th anniversary of the Young Communist League. Tahir went on to paint many more oil-related scenes over the following years. Subjects in his paintings include a deserted oil reservoir ("Reservoir Park", 1959), a group of three oil maintenance workers on their way to an emergency ("The Maintenance Men", 1960) and an up-close portrait of an oil worker ("Oil Worker", 1959). Unlike the scenes found in paintings following the style of Socialist Realism, Tahir's workers are not romanticized. Instead, they look serious, tired and dirty and often uncertain. The world he depicted on his canvases was not the confident, optimistic microcosm that the Soviets always tried to present to the world. Art: Tahir Salahov, "The Shift is Over", 165 x 368 cm, oil on canvas, 1957. Another example of Severe Socialist Realism can be found in Tahir's painting "Women of Absheron" (1967). [See the back cover of this issue.] A group of women stand near the shore, waiting for their husbands-oil workers-to return home. One assumes that the men live on Oil Rocks and only get a chance to come home occasionally. Instead of talking and mingling with one another, as would be expected of Azerbaijani women, their eyes look vacant, somehow resigned to their fate with the one exception of the oldest woman, whose eyes and face are more expressive of the situation. A sense of loneliness is created by the fact that each woman is looking off into the distance in a different direction. It's almost as if the women are statues, islands unto themselves. With their sullen expressions, they seem to be focused inward, unsure of the future, unsure of their destinies-separated from their men and forced to carry the responsibilities of their families on their own shoulders. The painting does not show the women happy to be part of the grand experiment of industrialization and production. Again, Tahir uses red to accent his painting, this time in two places: the clothing of the youngest girl and a piece of pipeline which helps identify the narrative for why the women are gathered together in the first place. The painting appeared in the 1967 All-Union Art Exhibition in Moscow; it is currently being kept at Moscow's Tretyakov Gallery. Tahir's travels abroad also influenced his style. He was one of the privileged few who got a chance to visit countries such as Czechoslovakia, France, Spain, Bulgaria, Italy, Mexico, Japan and the United States and painted many of the scenes that he saw there. In "The Mexican Bullfight" (1969), Tahir recaptures a moment from his visit to Mexico. The frame is dominated by a large, black bull facing off against a matador dressed in bright red. A few sombreros in the background represent the excited crowd in the arena. The focus is on the dramatic, ritualized conflict against what appears as a faceless enemy. Portraits occupy a special place in Tahir's creative activity. He has painted the portraits of Azerbaijan's foremost composers - Gara Garayev (1918-1982) and Fikrat Amirov (1922-1984) along with Azerbaijani poet Rasul Reza (1910-1981) and Russian composer Dmitri Shostakovich (1906-1975), to name a few. Each portrait reflects Tahir's efforts to draw out the inner worlds of his subjects. For example, Tahir's portrait of Garayev (1960) stresses the composer's inner concentration and creativity. [This portrait may be found in the article "Remembering Gara Garayev," AI 6.3, Autumn 1998]. Even though portraits were almost always painted with the subject facing forward, Tahir established a side view of Garayev. Once again, the colors are neutral tones, except for a bright red music book. Garayev's face is plunged in shadow, as if he has been caught in a moment of deep concentration. At any moment, it looks like the composer might suddenly stand up and rush over to the piano to jot down a few bars. This portrait was awarded the Silver Medal of the USSR Academy of Arts. Art: Tahir Salahov, "Portrait of the Russian Composer Dmitri Shostakovich", 136 x 115 cm, oil on canvas, 1974-76. 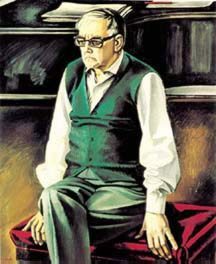 When Tahir painted Russian composer Dmitri Shostakovich's portrait (1974-76), he took a much different approach. Shostakovich, who was seriously ill when he sat for the portrait, solemnly gazes into space with his back to the piano. His frail hands rest on a red velvet piano stool. Today, Tahir Salahov lives in Moscow, where he is a professor and has a studio at the Moscow Art Institute. He has received numerous honors, including People's Artist of Azerbaijan (1962), Secretary of the USSR Artists' Union (1968), Member of the Central Committee of the Azerbaijan Communist Party (1970), Deputy to the USSR Supreme Soviet (1970), Order of the Red Banner of Labor (1971), President of the Artists' Union in Azerbaijan (1972), People's Artist of the USSR (1973) Head of the Studio of Easel Painting at the Surikov Art Institute in Moscow (beginning in 1974), Full Member of the Soviet Academy of Arts (1975), Order of the October Revolution (1976), Grekov Gold Medal (1977), Deputy to the Russian Supreme Soviet (1980) and numerous all-Soviet and State Prizes for his paintings. Tel: In Baku: (994-12) 492-6267 (studio); (994-50) 317-6446 (mobile). In Moscow: (95) 201-3971; Studio in Moscow: (95) 243-6551.